Now that's what you call good publicity! 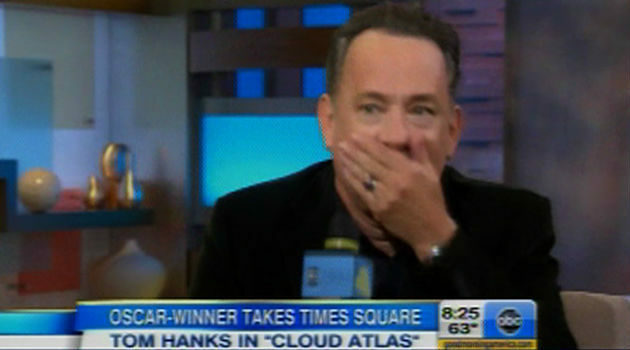 Tom Hanks of all people dropped an F-bomb on Good Morning America this morning (video below! ), shocking GMA host Elizabeth Vargas and putting the epic, arty Cloud Atlas on the map with those four little letters. Well done! If I had to wager I'd place Hanks as one of Hollywood's top three most beloved stars, so I'm 99% sure our glorious nation of moralistic, upstanding, non-swearing citizens forgave him on the spot when he subsequently cranked up that Hanks charm and apologized "to the kids of America that are watching this right now." Yes, all of those GMA-watching youngsters, Tom. To be fair Vargas pressed Hanks into doing his Cloud Atlas Cockney accent, which makes his Cloud Atlas pidgin English accent sound like Shakespeare. Hanks even protested a bit, explaining that his British voice consists pretty much only of foul language. But no matter: LIZ VARGAS WANTED THE VOICE! If you ask me, Hanks's f***in' slip up was a great happy accident, the perfect stunt for getting the masses interested in the Wachowskis and Tom Tykwer's massively ambitious film. "Tom Hanks plays multiple characters? And he swears?? Sign me up, honey!" Etc. etc. "Hanks even protested a bit, explaining that his British wanker voice consists pretty much only of foul language." Wait, did he actually use the word "Wanker" on air? It's great fun for us Brits to be able to slip the odd stealth swear in to conversations with Americans, but surely everyone knows what that word means by now? Hilarious Hanks! Hey does anybody here knows where else I can watch movies online? http://bighollywoodmovies.com/ is the only place I know. Thanks!